This high contrast two tone sweatshirt offers some of the best protection for hi-visibility available. Manufactured with anti-pill 100% polyester fleece, this sweatshirt features a stylish yet functional black bottom design that helps provide a clean appearance by hiding dirt & grease in areas of frequent contact. The convenient pullover design is equipped with a drawstring hood and large kangaroo front pocket for basic storage. 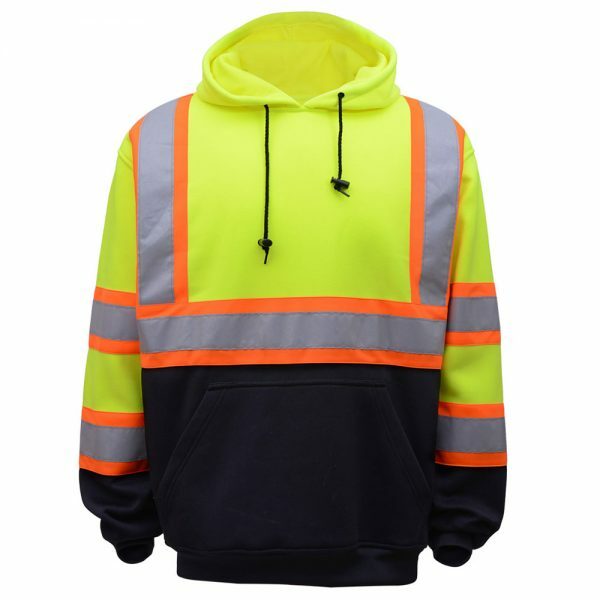 It features a two-tone 2-inch reflective tape with a 3-inch contrasting orange background stripe to make sure you’re always as visible as possible during extreme weather and other low-light work environments. This sweatshirt is ANSI/ISEA 107-2010 compliant.